Mad Catz | SDTEKKEN.COM - TEKKEN News Resource! Peripheral maker Mad Catz, announced today their agreement with Namco Bandai Games Inc. to produce an arcade stick for SOULCALIBUR V! Click below for the full press release and a forum post from SRK Tech Talk that goes over the features and changes to the FightStick. Stay tuned for more news! In the video above FilthieRich talks about the latest arcade stick by Mad Catz which will be distributed in a special bundle with the collector’s edition of Tekken Hybrid. If you are a Tekken fan, you can’t miss it! Yet, be aware that this bundle is very limited, so if you want to pre-order it, do it right now. Ultimate Fighting Game Tournament 7 Weekend! Win Some Cool Stuff! Ultimate Fighting Game Tournament 7 is now LIVE! Check it out on Level|Up Series justin.tv portal ! Check out some of the cool contests that UFGT, Level|Up and Mad Catz are putting together! Click below for all the details! 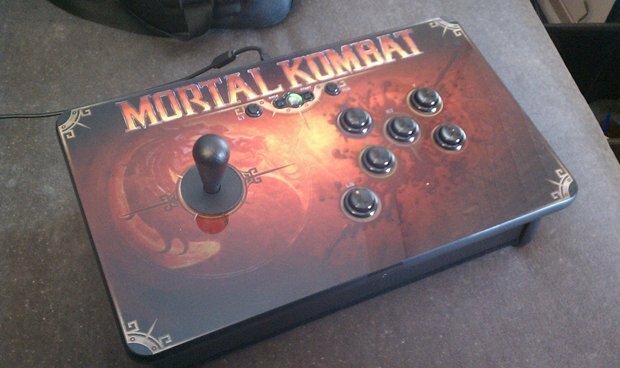 Should You Buy The Mortal Kombat TE Stick? Aris sits down and take a look at the options for arcade sticks for the upcoming Mortal Kombat title (Out April 19th). Do you even need an arcade stick for this title? Find out by clicking below! Mad Catz Announces Marvel VS. Capcom 3 FightStick! I’m gonna take you for a ride! Mad Catz just announced their new Marvel VS. Capcom 3: Fate of Two Worlds Arcade FightStick Tournament Edition to coincide with the game’s release later this month! Using the same tried and true formula of the community adopted Tournament Edition formula, the MVC3 FightStick will retail for $159.99 and is available for pre-order now at the Mad Catz GameShark Store. You are currently browsing the archives for the Mad Catz category.